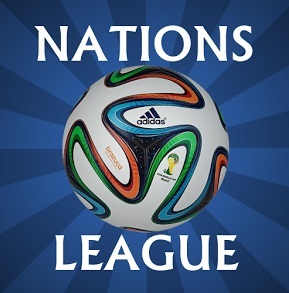 UEFA has announced the much awaited and talked about UEFA Nations League which will take place during 2018 and 2019, the format is a bit complex but the biggest advantage of the competition is that minnow teams from Europe will have equal chance of getting into the European Championships. While the other advantage is that this competition will cover up many meaningless international friendly games for European teams. Lets take a look at the format. There will be four divisions which are further divied into 4 groups which contain 3 or 4 teams each. Division A will have group groups of 3 teams each and highest ranked teams like Germany, Spain, Italy, England, Portugal etc will be in this division. Than there is division B which will have 12 teams divided into 4 groups of 3 teams each, followed by division C which will have 10 teams with two groups of 3 teams and 2 groups of 4 teams. Group D will have 16 teams which are the lowest ranked teams from europe. divided into four groups. The teams who finished at the bottom of the groups will be relegated while teams finishing top of the groups will be promoted from D to C, C to B and B to A. 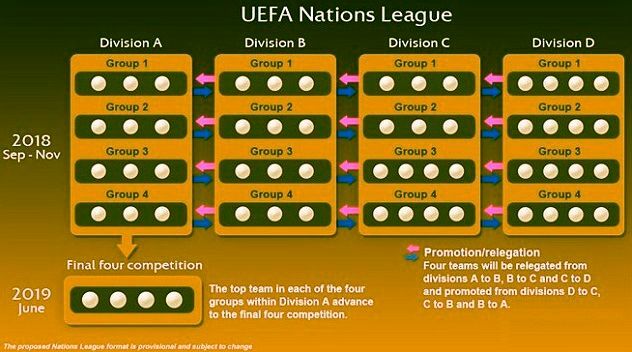 Once the group stage is over, the team (4) who finished top of the groups in division A will play knockout competition comprising of semifinal and final to decide the UEFA Nations League winner. The qualifying rounds for European Championship will take place as it is with 20 teams qualifying through the normal procedure. While 4 other teams will have a chance to make it through to the competition by winning their divisions playoffs. 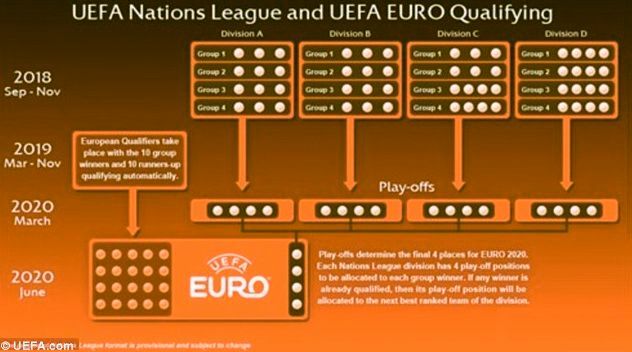 Here is the diagram explaing how the UEFA Nations League playoffs system will work.